Studied Classical music at Chichester and PG Trinity College London. Former Keyboard/Synth and Violin player with Gary Numan Band and Tubeway Army from 1979-1990 on studio and live projects. Co-writer of the Visage hit ‘Fade to Grey’. Various other co-writes for Johnny Warman, Mediaeval Baebes, Dramatis, Kelly Osbourne and Rusty Egan. 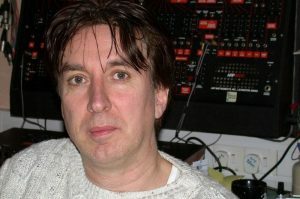 Film and media music composer from 1985 to present day having written and had published over 600 compositions. Styles include Classical, Choral, Drama, Gothic, Horror, Folk, Celtic, Medieval, Baroque, Electronic, Minimalist and solo piano. Specialist in Orchestral and Choral works having composed, orchestrated and conducted in London, Paris, and Prague, and also specialises in electronic, minimalist, and sound design. Most well known work to date ‘Declamation’ used in several feature films, adverts, documentaries and as the intro music for Iron Maidens 2003 world tour. Solo piano based album called ‘Between Betjeman, Bach and Numan’ released in March 2012 on Coverdrive records and published by Kassner music. Also working on ‘A Flock Ascending’ project with Michael J Stewart, who studied under the late Sir John Tavener. Film and TV projects with Rusty Egan and Art Bennet. Music published with Universal, Warner Chappell, PMOL, Kassner and Long Lunch Music.